The days between 14 May and 4 June in 1991 were the most productive of Helen Frankenthaler’s career in printmaking. Reuniting with Monotype master printer Garner Tullis after their initial 1982 collaboration, Frankenthaler sometimes made as many as five Monotypes a day at Tullis’ New York studio that spring. She remarked, “I bring the liberties of my painting studio to Monotypes.” Monotypes are unique works of art produced by painting directly upon a plate that is later pushed through a press. The technique can be vexing; the final image reads in reverse with those inks on the printing plate’s top layer appearing as a final work’s bottom layer. For this series of 30 Monotypes Frankenthaler alternated between aluminum plates and woodblocks. Sometimes the ghost image of a previous work was used as a base layer for the next one. 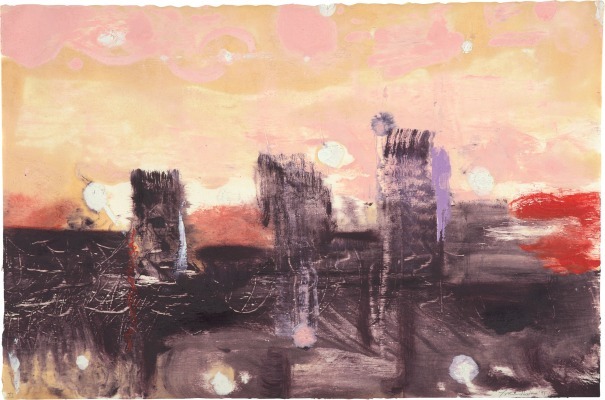 Helen Frankenthaler’s work on this group of Monotypes later led to her The Clearing series. Monotype in colors with extensive hand-additions, on Fujimori-Awagami paper, the full sheet. Signed, dated and annotated 'XI' in pencil, additionally signed and annotated '28 May '91 Monotype #1' on the reverse, published by Garner Tullis Workshop, New York, framed.